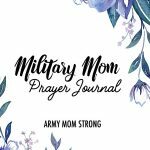 Is your son or daughter deploying to South Korea? 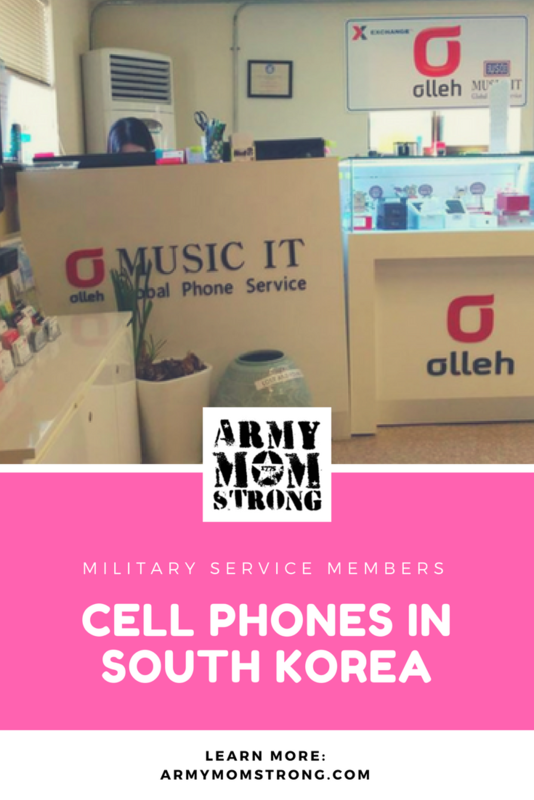 In this post I share some tips about cell phones in South Korea. Your son or daughter’s phone may not work in South Korea. And even if it does, they will be charged crazy roaming fees for phone calls, data and text. Instead, put put their U.S. phone on temporary Military hold. Contact the cell phone provider to find out what they needin order to do so. Each mobile phone provider has their own policy. Your service member should definitely get a phone in South Korea. 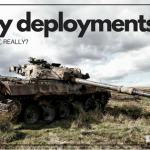 Mobile phones are easy to get and most military posts have a mobile phone shop on post. 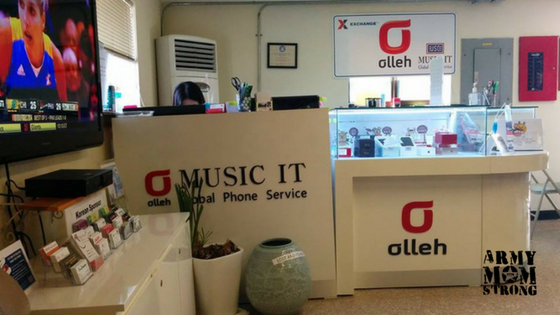 For example Camp Humphreys and USAG Yongsan has the mobile phone shop called Music IT located in the USO building. I am sure other bases have it as well. The mobile phone contracts are either for 1 year or 2 years. 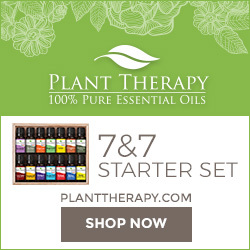 Pay attention to the small print! Another important point – your service member needs to communicate with co-workers, superiors, other services on post. Therefore a Korean phone number is must. They need to communicate in-country. And, any mobile phone can work over WI-FI to connect to Internet, email and apps. Once your service member has their Korean phone, you both need to download one of the apps that will allow you to text and/or talk for free. I am not suggesting you download all. Choose at least two in case one is not working properly when you are trying to connect. If you have a different method to communicate, we’d love to hear about it! Please add it to the comments below. [OPTIONAL] Most newer phones nowadays support LTE data, which operates on bands 3, 8, and 26 in Korea. If your phone doesn’t support one of these bands, however, it should still connect at 3G speeds using the WCDMA 2100 MHz frequency. You can search Google for your cell provider policy about military phone holds and suspensions. Thanks so much. I just was on the phone with AT&T (they r so dumb lol) trying to figure this out. We never have used snap chat or instagram. I never really liked skype. But, I had forgotten about all that so I type into Google “how do I stay in touch with my soldier” and you came up. Thank you so much I will be reading your stuff and subscribe or whatever! Mark and Lisa Roberts and family. Our son has been in South Korea for a couple months now and I HIGHLY recommend KakaoTalk. We are able to do everything our iPhone would do – text, send (take) photos/videos, voice call and/or video call. 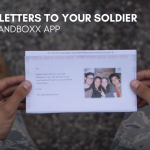 We love KakaoTalk for letting us keep in touch with our army son! My son was just recently stationed in South Korea. We have been using WhatsApp to communicate. It has worked well so far. Thank you for posting this article. It helped us make some decisions regarding his cell phone. 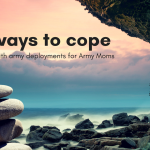 It helps when there is a place to go and receive some guidance on issues that we have no experience with or no idea how to handle. Thanks! I updated the article to include WhatsApp. Thank you so much for this information. My son was just given his first duty station and will be leaving soon for Korea. 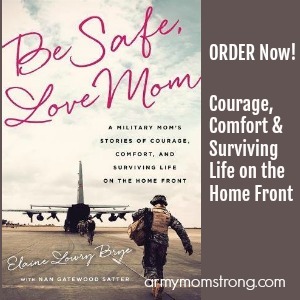 I have only been an Army mom for 10 months and sites like this are a huge help and comfort. Is this information still correct in 2018? How much are the phones in S Korea at the base stores? So, an AT&T iPhone does work in SK, but just charges crazy rates unless you are on wifi and use one of those apps? Thanks for this info. I’m trying to research for my soldier. And THANK YOU for your service. Thank you for all the great info. My son and I also use SnapChat to communicate, sometimes it’s slow as weather may impact the service. But a great way to talk. Always check with your phone company and type of phone. But, yes, just use wifi and an app to avoid high calling charges.